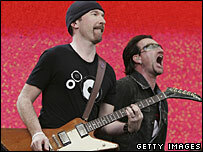 U2's The Edge has donated his favourite guitar to a charity he co-founded to replace instruments lost or destroyed when Hurricane Katrina hit the US. "I wanted to give something really significant," the guitarist told the Associated Press news agency. Almost 200 items have been given to the Music Rising organisation for the Icons of Music auction, ending on 21 April. They include a saxophone signed by former US President Bill Clinton and an Elvis Presley recording contract. The 45-year-old musician has used the 1975 Gibson Les Paul guitar he is donating throughout his years with the band. U2's Adam Clayton donated a bass guitar to the auction, while bandmate Larry Mullen gave a pair of tom-tom drums and Bono donated a pair of designer sunglasses. The Edge, real name David Evans, created Music Rising in 2005 with record producer Bob Ezrin and Henry Juszkiewicz, chairman of guitar-makers Gibson. "One of the good things about globalization is it has created a single international music community, and I feel very much part of it," said The Edge. "So this doesn't seem like it's someone else's problem. It's really our problem too." He said jazz from New Orleans "was the forerunner of everything". "You mix jazz with European rhythms, and that's rock 'n' roll really. You can make the argument that it all started on the streets of New Orleans with the jazz funerals." Hurricane Katrina hit the southern US in August 2005, causing flooding in the Louisiana city of New Orleans that killed some 1,300 people. The population of New Orleans fell from nearly 500,000 to less than 200,000 in the wake of the disaster.